Async iterators add support for a new loop structure, a for/await/of loop, that looks like what you see below. 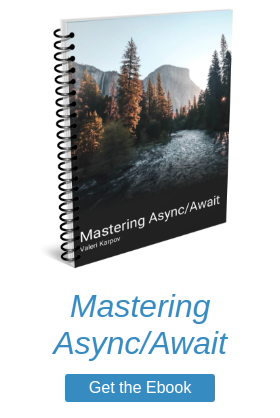 If you've read Mastering Async/Await, you know that await must be in a function marked async. Async iterators are no exception. You can only use a for/await/of loop in an async function. If you're not comfortable with async/await, this blog post will bring you up to speed. Now that the syntax is out of the way, let's take a look at how Mongoose leverages async iterators to make scanning through huge collections easier. Suppose you have a collection of stocks and you want to pull the current price for each stock from the IEX API. Below are the schema and model for this example. const price = await superagent. The problem with the above approach is that it loads all stocks before starting the loop. That's fine for 3 stocks, but if you have thousands you should instead use a Mongoose cursor. You can use async/await to iterate through a cursor as shown below. This syntax works, but it is verbose and tends to run over 80 character line limits if you use readable variable names. Async iterators make iterating over a cursor much more terse: if you use a Mongoose query as the right hand side of a for/await/of loop, Mongoose will create an async-iterator-friendly cursor for you. The below loop is equivalent to the await cursor.next() loop above, as long as you're using Node.js 10.x. The sort(), limit(), skip(), and lean() helpers all work as you would expect with async iterators. Query populate() also works, but with a small performance caveat. If you use populate() with a cursor, Mongoose will execute a separate query for each document that comes off the cursor. For example, suppose you store stock prices in a separate collection. A Mongoose cursor does not conform to the async iterable spec. If you use for/await/of with a Mongoose cursor you created yourself, you will get an error. // Throws "TypeError: Stock.find(...).cursor(...) is not async iterable"
Async iterator support is just one of 17 new features in Mongoose 5.3.0. Mongoose 5.3.0 also introduced the orFail() query helper, a deleteModel() helper to clean up models after tests, and regular expression support for Schema.pre() and Schema.post(). Make sure you upgrade and take advantage of these powerful new features!